54cm freestanding cooker, conv oven is rated 4.3 out of 5 by 26. 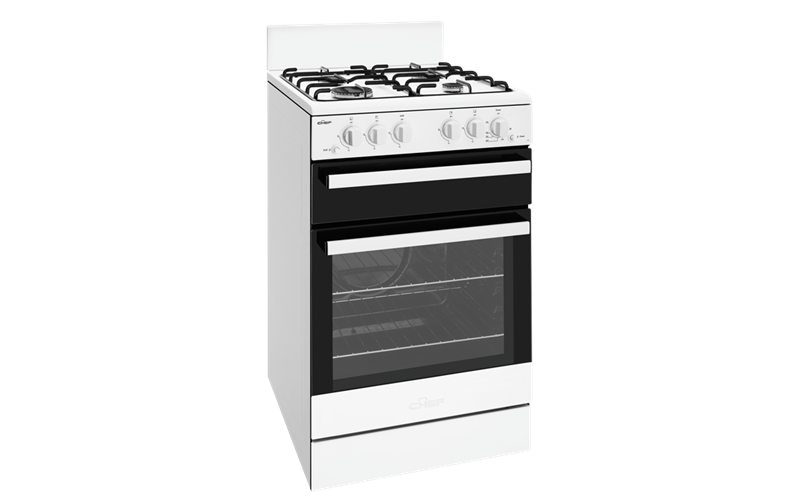 White 54cm freestanding cooker with conventional oven, piezo ignition, separate gas grill, flame failure and 4 burner gas hob. Rated 4 out of 5 by Han91 from Great product Value for money Little oven to go in my rental property. Had the same model for years before that. Rated 4 out of 5 by Wendy from Please provide oven trays to purchase as extras. Very disappointed no oven trays were included in the oven.Unable to purchase a tray of 30x35 cm to fit, as recommended in instruction booklet. Grill piece in griller tray rattles with any movement. Sixteen years ago my Chef stove came with two quality oven trays. Rated 4 out of 5 by Eric07 from Great value A very affordable gas oven and energy efficient. Great for something simple and efficient. Rated 3 out of 5 by TE2018 from Good basic cooker. I bought this cooker about a month ago. It is easy to use and very easy to clean. Rated 3 out of 5 by luckysmum from Chef CFG503WA Freestanding Oven/Stove Whilst happy with the stove overall, we found a couple of disappointing features. The griller door is very thin and the stovetop dials are a bit odd. High is halfway around the dial and low is where high would normally be, It's taking a bit of getting used to. Also a couple of the jets take some fiddling to replace after cleaning. Other than that it works efficiently and the oven is quite spacious.